Mendocino is a county with two faces. One face, the softer side, is well known. This is the coastal half that contains Anderson Valley, where delicate Pinot Noir and exceptional sparkling wines are enjoying increasing, and deserving, renown. The other face of Mendocino resides further east, in the cache of old vines that sprawl across the Redwood Valley appellation and surround the towns of Ukiah, Talmage, and Hopland. Here the vines have long labored without fanfare, their fruit blended into anonymity across county lines. But a growing number of vintners, both local and ex-county, are waking up to the remarkable quality contained within these venerable vineyards, and more attention is sure to follow. As exciting as the lacy creations of the coast may be, it’s time to turn our backs to the sea and our eyes toward the remarkably preserved historic legacy of inland Mendocino. Unlike in most of California, vinifera vines were not introduced to Mendocino via the Spanish. Spain’s missionaries only made it as far north as Sonoma before losing California to Mexico in 1821. Because of this, vinifera didn’t really arrive until the Gold Rush, when a population of predominantly Italian settlers began cultivating the various valleys of Mendocino. This development was extremely limited at first. According to Charles Sullivan’s A Companion to California Wine, in 1890, there were only 20 vineyards in all of Mendocino County, totaling only 204 acres of vines. And by 1891, only two wineries were registered with the state. Mendocino’s first major viticultural push came after 1906, when the Italian Swiss Colony invaded Ukiah Valley. By 1909, 2,700 acres of vines had been planted, mostly for the Italian Swiss Colony, representing more than a tenfold increase since 1890. Prohibition brought another bump in development, when a rush of vines, mainly Carignan and Zinfandel, were planted in service of home winemakers all around the country. By 1925, over 8,300 acres of vines were in the ground. Though Prohibition expanded vine acreage, Mendocino’s producers were slow to recover. Sullivan reports that only 14 wineries (all owned by Italian families) sprang back to life upon repeal, with Parducci the sole survivor into modern times. With home winemaking on the decline and a limited local market, most of Mendocino’s fruit was shipped out of the county and used as a blending component for wineries in Napa and Sonoma, as well as the bulk operations of the Central Valley. Even so, vineyard acreage declined until the late 1960s. Mendocino County is perhaps most famous for its redwood groves, and timber has long been a major industry of the region. Oak tanbark, which is used to cure leather and animal hides, also brought significant business, especially in the wild coastal areas such as today’s Mendocino Ridge. The pursuit of these two products was responsible for much of the original settlement, but the nationwide urbanization that followed World War II saw a significant portion of the local population, especially in the more rural reaches, leave for the cities. Unsurprisingly, this also contributed to the decline in viticulture. It would take the back-to-the-land hippie movement of the 1960s and early 70s to bring forth a swell in Mendocino’s ranks. Mendocino experienced its first jump in production in the 1970s, as the boutique winery movement that had already transformed Napa and Sonoma slowly spread northward. This effectively got Mendocino’s production off its deathbed; all but two of today’s wineries were bonded after 1968, according to Sullivan. As of 2018, Mendocino can boast of around 90 wineries, but even so, the region remains far richer in vineyards, with over 20,000 acres under vine. A key reason why there are fewer wineries than one might expect is the lack of tourism. Aside from the burgeoning destination of Anderson Valley, there is little in the way of hotel or restaurant presence, especially inland. It also doesn’t help that the region is a significant distance from any major city, located two and a half hours by car from San Francisco. There is a silver lining to all this, however. First, the under-the-radar nature of the wine region means there is tremendous value for the consumer. This is true both of the wines, which tend to cost significantly less than those of equivalent quality from more established regions, and in terms of tourism. While you can certainly spend $500 a night on a room in Anderson Valley if compelled, both lodging and dining in Mendocino County are generally reasonable. In addition, when it comes to viticulture, the absence of investment can sometimes have a conservational effect. 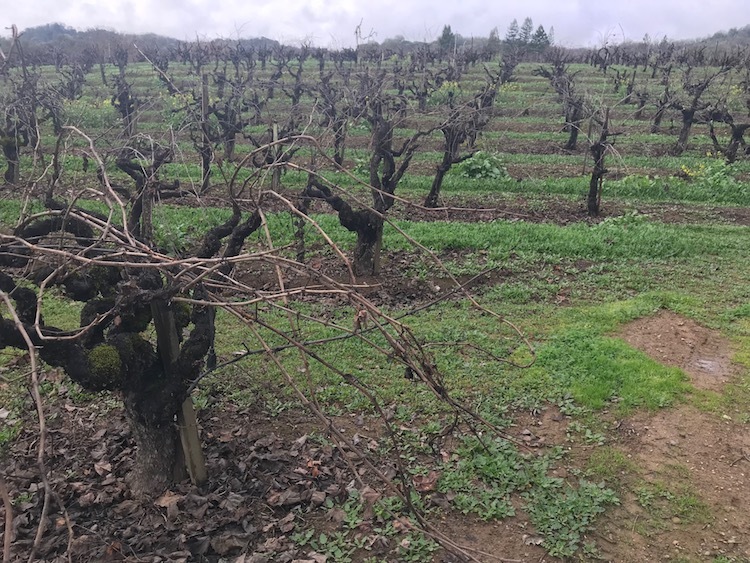 After all, since Mendocino’s farmers, especially in the inland corridor, don’t face the same pressures as growers in Napa to replant everything to Cabernet Sauvignon or other more profitable varieties, funky old-vine vineyards of all types are left alone to thrive. The Missing 15% & The Attack of the Hipsters! “Everyone’s tried Mendocino wines—they just don’t know it,” one grower joked to me during a tasting. “We’re that missing 15% in Napa and Sonoma’s wines!” This quip, of which I heard many variations during my visits to Mendocino County, refers to California’s label laws. As a given wine need only be composed of 85% fruit from its listed AVA, many wineries in more premium regions will use this to their advantage, padding their blends with Mendocino’s considerably less expensive bounty. The math is simple. In 2016, the average ton of Napa Cabernet cost nearly $7,000 while a ton of Mendocino Cabernet commanded slightly over $2,000. “We estimate that 55% of Mendocino fruit leaves the county,” says Bernadette Byrne, Executive Director of the Mendocino WineGrowers. This incredible statistic persists despite some very big local players, sizable operations such as Fetzer, Parducci, Frey, Roederer, and Duckhorn’s Goldeneye and Waterfowl. “Constellation, Treasury, Vintage Wine Estates—they all buy a lot of fruit here,” Byrne continues. Coupled with that 15% padding of the independent brands, these exports far outweigh the demands of even the largest homegrown producers. In short, with the growing exception of Anderson Valley, there is not much Mendocino wine being made in Mendocino. While Mendocino brands such as Saracina, Campovida, and Trinafour are proud to showcase local old-vine vineyards, they are in the minority. One initiative to keep Mendocino fruit in county while honoring the area’s history is the Coro Mendocino program. Launched in 2001, this is a special label of wine, not unlike Lodi’s Native project, that strives to recreate the Zinfandel-based field blends of Mendocino’s past. Each wine must be a blend of a maximum of nine varieties, with Zinfandel accounting for 40 to 70% of the final product, with all grapes sourced from Mendocino. To be labeled as Coro, the wine must first pass a blind assessment by a designated panel. As such, the number of wines on offer varies considerably from year to year. Mendocino sits just to the north of Sonoma, and directly west of Lake County. It is a large and sprawling region which can be arguably cleaved into two pieces: coastal and inland. Anderson Valley, Mendocino Ridge, Yorkville Highlands, and Cole Ranch belong to the former category, as they are very much defined by their relationship to the coast. The remaining AVAs, including Potter Valley, Redwood Valley, and Eagle Peak, are mostly out of reach of the ocean’s influence. This imparts the two areas with dramatically different climates, and dissimilar varietal needs. Burgundian grapes and aromatic whites thrive in the chilly west, while hearty reds and Bordeaux varieties soak up the sun of the eastern district. The census is not entirely complete, but Mendocino WineGrowers reports that as of 2018, the county is planted to nearly 20,000 acres of wine grapes. Most vineyards are family owned and small, with the average size landing at just over 33 acres. Currently, Chardonnay leads the pack, with approximately 5,500 acres in the ground. Cabernet Sauvignon and Pinot Noir are effectively tied for second, with 2,892 and 2,765 acres, respectively. Zinfandel (1,592 acres) and Merlot (1,514 acres) are similarly matched, with Sauvignon Blanc, Syrah, and Petite Sirah coming next, in descending order of importance. Anderson is one of California’s rare transverse valleys, which means it runs along more of an east-west axis than the more typical north-south alignment. This orientation permits Pacific fog and breezes to penetrate further inland, making for an overall cooler microclimate. Though technically Anderson Valley cants from the northwest to the southeast, the effect is the same. The valley itself extends 15 miles in length, with the northwest corner of the AVA significantly cooler than the southeast, as it is that much closer to the ocean. Anderson Valley’s soils vary but tend to be rich in loam, with differing amounts of rock and gravel. A recent survey showed that of Anderson’s 2,500 acres, nearly 70% (1,700) were Pinot Noir, with Chardonnay (559) second, followed by Gewürztraminer (103), Merlot (73), Pinot Gris (41), and Riesling (22). The aromatic whites, especially those of Navarro, Handley, and Husch, are often the best in the state. Though produced across a spectrum of sweetness, the most successful are bone dry in style. Pinot Noir has long been the regional star and tends to land somewhere between the more citric, high acid style that typifies the Sonoma Coast and the soft, generous style associated with Carneros. Historically, Chardonnay has taken a backseat in Anderson Valley, but the variety seems to be enjoying a sudden surge in quality. Anderson Valley was originally settled in the 1850s, with the first known vineyards planted around the turn of the century. Viticulture remained a minor pursuit for decades, until the area’s potential was recognized by A.J. Winkler in 1960. Professor Winkler traversed the state and issued a report recommending the valley as one of a handful of promising regions for wine production. Despite this glowing endorsement, the area’s first winery, Husch, wasn’t bonded until 1971. In the 1980s, Anderson Valley developed a strong reputation for sparkling wine, with Scharffenberger and Roederer Estate founded in 1981 and 1982, respectively. Pinot Noir-based brut was the dominant style, a tradition that persists today. In the 1990s, still Pinot Noir rose to prominence, largely through the vineyard designations of Littorai and Williams Selyem. This reputation continued to swell during the Pinot Noir craze that began in the early 2000s, and investment followed. Today, the appellation is home to around 30 wineries, many of them rather polished and affluent in feel. Though Anderson Valley is still bucolic, with ranches, orchards, and livestock, one quickly notices that the barns are perfectly appointed, and even the sheep appear coiffed. Yorkville Highlands is effectively an inland extension of the Anderson Valley AVA but is remarkably different in character. The little fog that creeps this far east burns off considerably earlier in the morning. The average daily temperatures are higher than those seen in Anderson Valley, and the vineyards tend to occupy more lofty elevations, from around 500 to 2,500 feet. Because of all this, Yorkville Highlands is planted to an entirely different cast of characters. Of the near 400 acres of grapes, Cabernet Sauvignon is dominant. This is followed by Syrah, Pinot Noir, Petite Sirah, Merlot, and Sauvignon Blanc. Ripeness is not an issue here, and the wines tend to be quite muscular in build. Mendocino Ridge is a large region that spans a fair amount of dramatic and forbidding mountain terrain. Vineyards can be found as high as 2,600 feet, but only sites located at or above 1,200 feet in elevation can claim the AVA. That said, anything planted below 1,200 feet is unlikely to ripen, as the area is so chilly that fruit needs to be grown above the fog line and in full sun to thrive. Because the appellation is composed of a series of peaks, the AVA map more closely resembles an archipelago than a typical wine region. Though the Mendocino Ridge AVA shares a border with the equally sprawling Sonoma Coast AVA, the regions are fairly distinct. Mendocino Ridge tends to feature significantly higher elevations and, instead of the sandy Goldridge soils that typify the southern Sonoma coast, is covered in what is known colloquially as “timber soils”—effectively, well-draining sandstone and loam dominated by fractured stone. Wind and rain are the primary enemies here, as both are quite extreme and conspire to curtail ripeness. Labor is also a challenge for such a remote region. Steve Alden of Murder Ridge, one of the architects of the AVA, refers to life in this AVA as “farming in the wilderness.” Indeed, my vineyard tour with him included stops to examine bear marks on fence posts, wild boar damage, and rafters of terrorizing turkeys. “I used to have statues of coyotes in the vineyards, to scare away the grape-eating turkeys, but the wild pigs destroyed them,” Alden confessed with a weary sigh. Like many of the area’s landowners, the Aldens came to the region in pursuit of timber, which was the dominant industry up through the 1980s. They soon came to realize that logging every 20 years wasn’t going to float the property and sought to diversify. “My neighbor handed me a dormant vine and said, ‘I take this stick, I put it in the ground, and three years later everyone’s bugging me for the fruit.’” Originally, Alden planted Zinfandel, but he eventually switched focus to Pinot Noir. Indeed, these are the two mainstays of the region, though Pinot Noir brings a much greater return on value. Chardonnay, Syrah, Merlot, and Riesling are also present in scant amounts amidst the AVA’s paltry 209 acres under vine. Cole Ranch is perhaps most famous for being America’s smallest AVA. This tiny appellation, which encompasses only 60 acres of vines within a 189-acre area, was established the same year as Anderson Valley by the Cole family, at a time when registering an appellation was a much easier process. Then as now, the AVA encompassed only a single estate, owned by Esterlina Vineyards. While this may seem a tad ridiculous, the property is extremely remote and doesn’t seem to belong to any of its neighboring regions. It is tucked deep into the forest along the narrow and winding Route 253 that connects coastal and inland Mendocino. Ocean fogs still penetrate this region, and the thick forest and hilly terrain block out much of the afternoon light, which makes ripening a challenge. 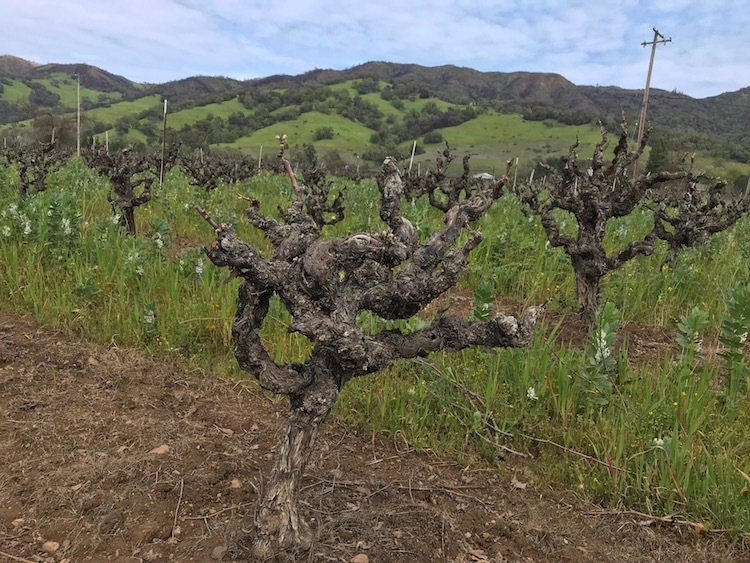 The ranch is currently planted to Riesling, Pinot Noir, Merlot, and Cabernet Sauvignon, though the new owner, Brian White, plans to replace the Cabernet with more Riesling. Since taking over in 2016, he has sold the Riesling, which was planted in the 1960s, to Bedrock Wine Company. There, the fruit is fashioned into both a Kabinett- and a Spätlese-style wine. White doesn’t yet know what to make of the Merlot as his first crop was destroyed when a bear knocked down that block’s fence, allowing a dozen wild boar to enter and consume all the grapes. Farming in the wilderness, it seems, isn’t strictly a Mendocino Ridge phenomenon. The Pine Mountain – Cloverdale Peak appellation is unusual in that it spans both Sonoma and Mendocino counties. And, despite the length of its name, the region itself is quite tiny. Most of the limited development (310 planted acres within an approved area of 4,750 acres) is confined to the Sonoma side, with a few notable exceptions, namely Pine Mountain Vineyards and a new site recently planted by Jackson Family Wines. Pine Mountain – Cloverdale Peak is hot, high, and dry. It sits just north of Sonoma’s Alexander Valley and contains some of the most elevated vineyards in all of California, ranging from 1,600 to 3,000 feet above sea level. Temperatures vary significantly based on elevation, with a unique inverted diurnal temperature switch in which cold air drops into the valley, displacing warm air into higher altitude areas. Marine fog also pushes warmer air up. As a result, the valley floor is cooler than the hillside vineyards. The soils are mainly gravel-rich loam overlain with considerable volcanic material. Most of the vines are Cabernet Sauvignon (79%), with Merlot, Malbec, Chardonnay, and a handful of others composing the balance. Just north of the town of Calpella are the adjacent AVAs of Redwood Valley, Potter Valley, and Eagle Peak. Of the three, Redwood Valley is by far the most viticulturally significant, boasting nearly 3,000 acres of vines and the county’s highest concentration of old-vine vineyards. Zinfandel and Carignan dominate the ancient plots, but French Colombard, Charbono, Grenache, and Petite Sirah can also be found. There is even a parcel of old-vine Sauvignon Blanc in the Lolonis Vineyard that is potentially the same age as To-Kalon’s famous I-Block (both are thought to have been planted in 1945 with cuttings from Château d’Yquem). Among the more modern plantings, Cabernet Sauvignon is the most important and currently covers 757 acres of ground. Other significant varieties include Chardonnay (555 acres), Zinfandel (521), Merlot (295), Petite Sirah (206), and Sauvignon Blanc (155). Redwood and Potter Valleys share similar soils, mainly alluvial in nature with fluvial corridors that follow the course of the Russian River, which has branches in both valleys. Most vineyards are planted on the valley floor, with little in the way of mountain development. This is likely because of the relatively low value of the areas’ fruit in contrast to the added expense of hillside farming. The two regions are also alike climatically, yet a few critical differences set them widely apart viticulturally. First, Potter’s valley floor is considerably higher than Redwood’s, starting at around 1,000 feet, so the vineyards are at different elevations. Also, Redwood Valley is fairly open at both ends, while Potter is effectively a bowl ringed by mountains. This traps the heavier cool air, which tends to pool along the ground. Because of this, Potter Valley is planted to predominately white varieties. Its 1,700 acres of vines are committed to Chardonnay (729), Pinot Noir (392), Merlot (264), Sauvignon Blanc (149), Pinot Gris (99), and Gewürztraminer (99). 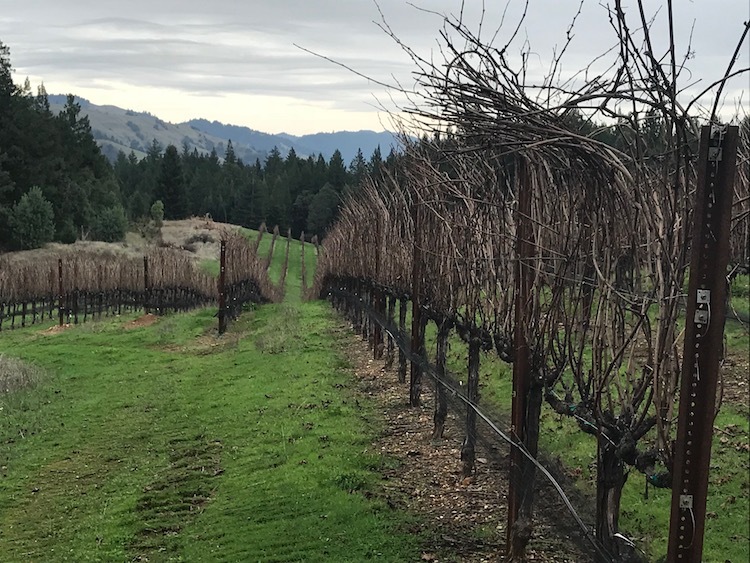 Finally, Redwood Valley is home to multiple wineries, including Frey Vineyards, while just one production facility, owned by Wayne Bauer, is located inside of Potter’s boundaries. Eagle Peak is Mendocino’s newest appellation, drawn to accommodate only a handful of vineyards. Brothers Jake and Ben, third generation of the extended Fetzer clan, were the authors of the AVA application. The Fetzers are something of a royal family in inland Mendocino. The family arrived in the 1950s when Jake and Ben’s grandfather’s job in the timber industry landed him in Mendocino. Barney Fetzer bought a large ranch that happened to contain a 100-year-old Mission vineyard, which effectively catapulted him into the wine industry. He expanded the vineyard and sold fruit for years before launching the Fetzer brand in 1968. Barney’s wife and their 11 children played active roles in the winery, and by the time they sold it to corporate interests in 1992, they were producing around 2.5 million cases of wine. The Fetzer brand was many people’s first introduction to the wines of Mendocino County, and the winery continues to be a leader in Mendocino production to this day. Following the sale of Fetzer, each of the children took their share of the profit and went in different directions. Not all of them stayed in the wine industry. Both Jake Fetzer’s father Bobby and his uncle Richard built private saloons, Richard’s complete with swinging doors, a wooden bar, and a rack of sawed-off shotguns. Bobby also planted a 35-acre Pinot Noir vineyard in what is now the Eagle Peak appellation in the late 1990s. This vineyard passed to his children, and Jake and Ben launched Masút from its production in 2009. 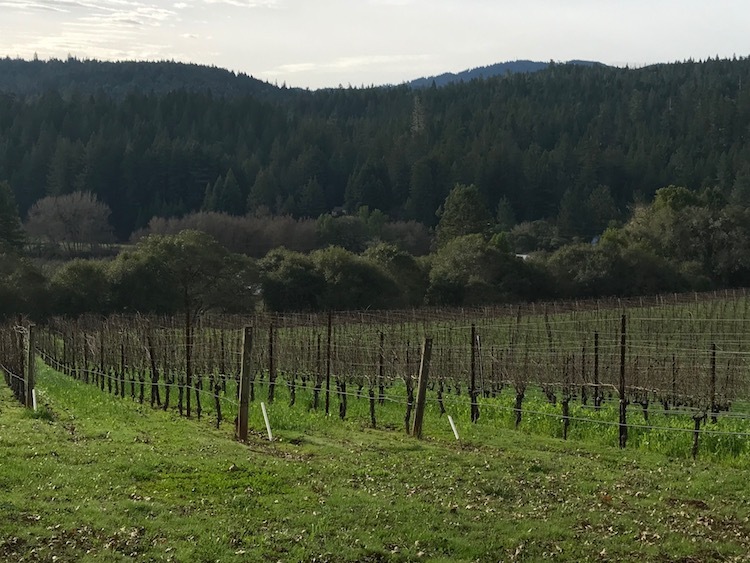 Situated in the mountains above the Yorkville Highlands and Cole Ranch, just to the west of warm Redwood Valley, Eagle Peak might seem like an unlikely place for Pinot Noir, but the results are terrific. The success is likely due to the high elevation (800 to 1,800 feet), significant slope, and dramatic winds that tear through the region daily. The temperatures also average 10 degrees cooler than in nearby Ukiah, and snow is an annual, if fleeting, occurrence. Unlike Redwood and Potter Valleys, Eagle Peak is a collection of sharply rising hills with very little development. Jake Fetzer estimates there are around 120 acres of vines are in the area. “We’re loners,” he quips. The soils are mostly weathered sandstone and gravelly clay loam. There is also a regional emphasis on quality, as by the nature of the terrain, all Eagle Peak vineyards are hillside sites. This stands in stark contrast to the flat plantings of the adjacent valleys, a difference apparent in the wines. The McDowell Valley, Dos Rios, and Covelo AVAs are among the least developed in Mendocino. Covelo, which lies far to the north of Redwood Valley, is utterly absent commercial vineyards. Bobby Fetzer had big plans for the region, but he sadly passed away before planting any vines. The Dos Rios AVA nearby boasts only a few vineyards, but they are of limited scale. Down in the southeast corner of Mendocino County is the McDowell Valley AVA. This used to be a single-estate appellation for a winery of the same name, but that operation has since closed. Today, it is dominated by Vintage Wine Estates and a handful of others, though plantings remain limited. It is effectively a long alluvial fan that stretches to 1,000 feet in elevation, in a microclimate that is slightly cooler than the surrounding region. Inland Mendocino’s AVAs are a bit out of step with the area’s plantings. Aside from Redwood and Potter Valleys, the sub-appellations seem to encompass few to no vines. Not only does Alder Springs, arguably the county’s most famous vineyard, fall well outside of the sub-AVAs, Mendocino’s largest plantings do, too. In fact, the real heart of inland Mendocino wine country surrounds the three towns of Ukiah, Hopland, and Talmage. Like Redwood Valley, these regions contain a good number of old-vine vineyards, mainly Zinfandel and Carignan, though over time the total acreage has swung to favor Cabernet Sauvignon and Chardonnay. Andy Beckstoffer has been farming in this area since 1973, when Heublein insisted that he take their Mendocino holdings along with the historic Napa vineyards he was looking to buy. Beckstoffer was reluctant at first, but quickly saw the quality potential and doubled-down on his Mendocino presence, purchasing another sizeable chunk of land the following year. “A large property came up for sale: 500 acres of plantable virgin land that just happened to have the 250-acre Mendocino state hospital attached to it.” Beckstoffer only wanted the land, but the hospital was an unavoidable part of the package. “Back then, Reagan was governor of California and was closing a bunch of facilities like that. Suddenly, I had this property that hadn’t been on the tax roll for years. I had no idea what those taxes might look like—they could have sunk the business!” Desperate to be rid of it, Beckstoffer attempted to give the hospital back to the government, which wouldn’t take it. “I reached out to everyone imaginable, religious institutions, everyone. Even Jimmy Jones! But finally, those Buddhists agreed to buy it.” The former hospital is now the City of Ten Thousand Buddhas, surrounded by hundreds of acres of Beckstoffer Cabernet and Chardonnay. Back in the 1970s and even the 80s, Cabernet Sauvignon fruit was nearly the same value as other varieties. “We bought vineyards up there because the old timers wouldn’t convert. They got the same price for Cabernet as for Zinfandel but with Zinfandel could get twice the yields.” Beckstoffer led the charge for the switch to so-called “premium varieties,” and others eventually followed suit. Today, the vast and warm Hopland area, home of the current Fetzer winery and hub for most inland Mendocino tasting rooms, is planted to over 5,200 acres of vines—1,435 acres of Chardonnay, 1,152 acres of Cabernet Sauvignon, and Merlot, Syrah, Sauvignon Blanc, and Zinfandel the next most significant. The Ukiah Valley area, where small, high quality producers such as Testa and Seebass exist alongside giants such as Parducci, is a touch cooler than Hopland and more dedicated to Chardonnay. Nearly one-third of its 3,000 acres is planted to the noble white grape, with Cabernet Sauvignon, Zinfandel, and Merlot playing the next most important roles. The region surrounding Talmage is an interesting one for viticulture. Of the areas of inland Mendocino without sub-appellations, this one has the highest potential for quality. The key here is what’s known as the Talmage Bench, a gently rising slice of land that hugs the eastern side of the Russian River. The soils are a bit rockier, with large river cobbles providing great drainage. Chardonnay again dominates (1,174 out of nearly 3,000 acres), with Cabernet Sauvignon, Zinfandel, Merlot, and Sauvignon Blanc also present. As previously mentioned, most of this fruit heads out of county right after harvest. Beckstoffer farms 1,200 acres of vines, which he mostly sells to the “big guys,” large corporations such as Gallo and the Jackson Family. Still, he senses a change coming. “In agriculture, when everyone is getting the same price for their grapes, the only way to get ahead [is] to get above-average yields. We wanted to get above-average price, which means we needed to get below-average yields.” Beckstoffer believes that once vintners and growers figure out which places are best suited to high quality Cabernet, those wines will be successful, and that success will shine a spotlight on inland Mendocino. If true, and established patterns hold, that would initiate a wave of investment which would likely endanger the very old-vine vineyards that Peter Chevalier thinks are the real jewel of the county. Mendocino’s hidden face might soon be caught between two potentialities: Chevalier’s vision in which the old vines are venerated as a regional treasure, and Beckstoffer’s prediction that Mendocino will walk the path tread by Napa in the 70s. It’s hard to say at this point which one will win out. Until the future descends, however, I’m happy to honor the past by filling my glass with something old and fabulous from Mendocino’s storied interior.